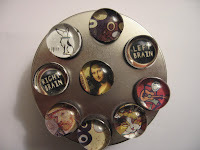 Gretchen and I decide in January 2006 to make these mini-magnet sets as Holiday gifts. So we've both been cutting circles out of magazines for the whole year. Sometimes, I would get to a new magazine too quickly and Greg would have to read a Time that looked like Swiss cheese. I simply loved making these mini-magnets and hope that everyone that received a set is happy to add them to their refrigerator. In fact, when the day came to take them off my door and hand-pick them into sets I was sad to see them go. 1.) 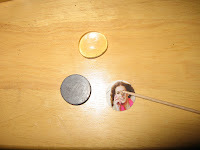 Using a toothpick put a small amount of glue on the picture and place the florist marble on top. Squish the glue around and center the picture while you adhere them together. 2.) 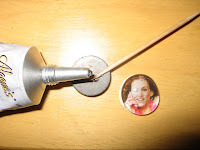 Glue the magnet to the back of the picture. 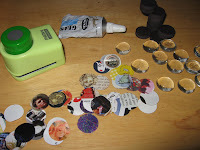 I know the directions are pretty simple because these mini-magnets are the easiest craft I've ever made. Packaging is such an important part of gifting. It was important for this gift that the magnets be presented in a metal box so that the receiver can see all the magnets at a glance. At first the plan was to use Altoids tins (which I believe Gretchen did) but I don't like that candy so I search around and found circle tins at a local Herb and Tea shop. I think these little presents are a perfect gift for just about anyone for Birthdays or Thank Yous. I even think they would make a great party favor at a kids birthday party or baby shower. 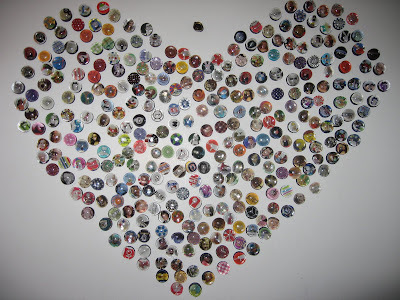 Please make a comment if you received magnets from Gretchen or me and let us know if you liked them. Our magnets were here waiting for us when we got back from PA. We love them! Thanks so much, Jes. Thanks for posting such a great idea. 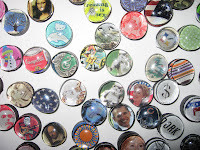 I saw some of these magnets on a friend's fridge this Christmas and wanted to make some as promos for my online etsy shop and you have given me a fabulous tutorial. Thanks for being willing to share!